This lovely paste came from Malaysia. I bought it in a supermarket in the biggest city, Kuala Lumpur. It reminds me of an Arm & Hammer Baking Soda mint toothpaste I had more than ten years ago; it's minty and yet has a strong salt aftertaste. However, it leaves my mouth feeling very clean. Color? Standard white. And it's a little thicker than the average American paste. 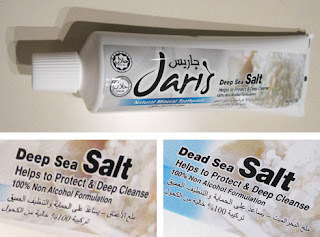 From their website: "Jaris an oral care range for the modern Muslim which uses ingredients from the Prophet’s era." So yes, it's halal, the Muslim equivalent of the Jewish "kosher." If you can find it in your neighborhood, buy a tube. It might be a refreshing change from what you're using now. By the way, I was amused that the tube says, "Deep Sea Salt" and the box says, "Dead Sea Salt."